75 Vaughan Street. A Gothic mashup with some truly wonderful features. This is not a ‘pretty’ house. I am just going to confront the 800# gorilla aka: the color. Pink? What/where/how did this get chosen? 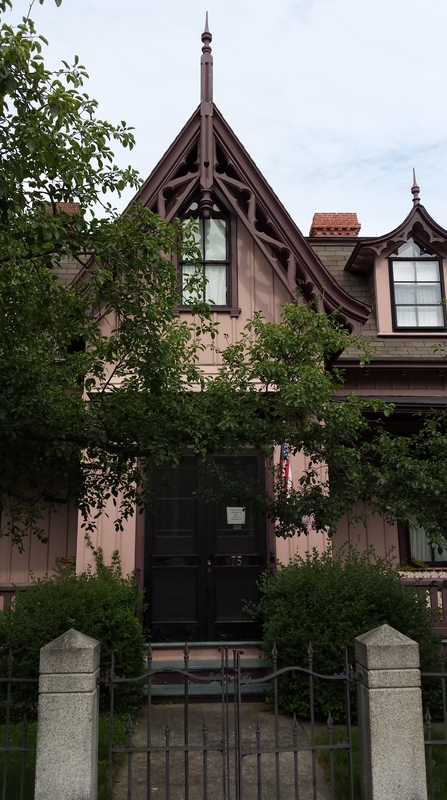 I am pretty sure there was no pink in the color pallet of 1859, the year of construction. Paint colors prior to the second industrial revolution were base, earth tones mixed on site. Colors tended towards darker shades of red, green, and brown along with white and a ‘muddy gray. It’s not even a nice shade of pink, if that’s even possible. Next up is the basic form and layout. 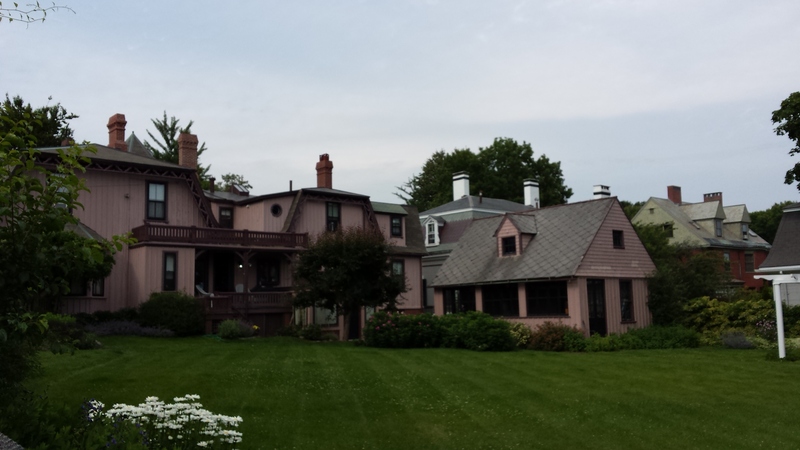 The main block is a 2 story box with an extremely heavy mansard roof capping it off. Attached is a service wing, also 2 stories, that is capped with a roof that is not mansard or gambrel but an unpleasant mix of the two. The shapes do not integrate well nor is anything slightly Gothic about them. Strip away the board & batten siding and over-scale verge boards and your left with something closer to the James O Brown house of 1860 located next door at 14 Bowdoin Street. In the corner of the 2 blocks we have a turret, costume de rigueur for Gothic Revival eh?, with an ill fitting 8 sided roof. The usual function of a turret such as this is for the stairway. The window layout and treatment suggest this turret houses rooms instead. I quite like this side entry. The way the roof flows into the shed roof, down the walls and down the stairs is very inviting. 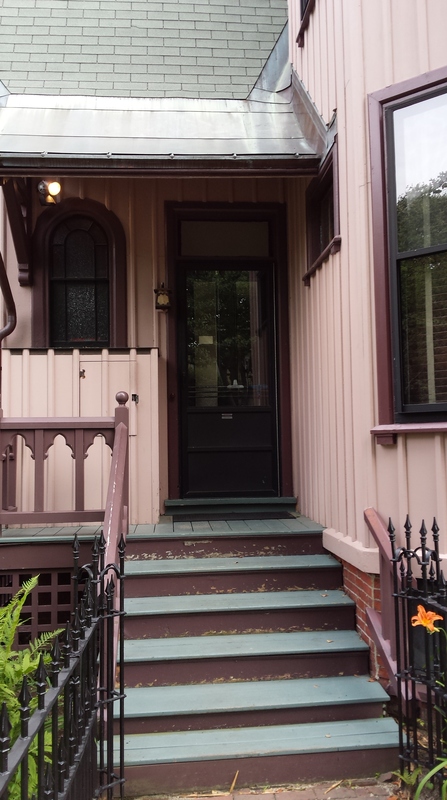 The treatment of the door and window along with the garden and iron fence create a soft, comforting feel. Quite nice. My guess is the design intent was a French Chateauesque look. I am not sure that was achieved. Be that as it may, let’s look at some of the other sides of the house. The southern side again displays an uncomfortable mashup of shapes. 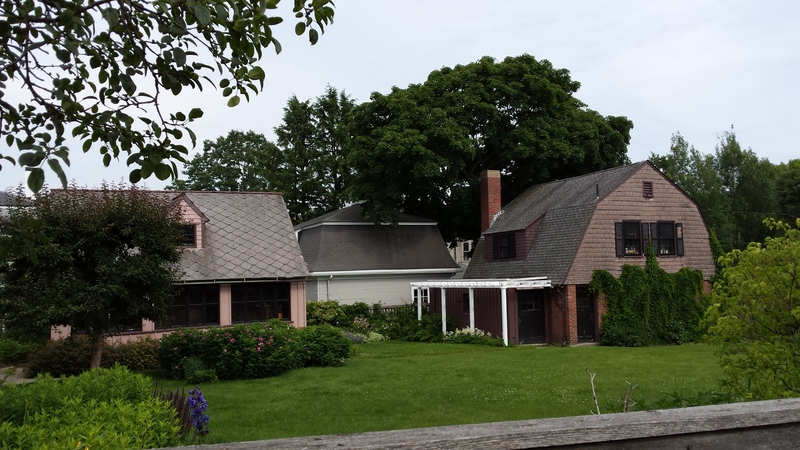 One might be inclined to think of the classic “New England connected barn” as a source but that movement happened 20 years after the house was built. The 2nd floor octagonal window and the ugly addition it’s in need to go. It appears to be a bathroom given the vent stack in the roof above. Very 70’s. Very uncool. The garden building, for the lack of a better term, is cute but seemingly oversized for the lot. The lot is large and well landscaped. The garage strikes me as newer than the house. The shape, materials and roof form suggest, given the neighborhood, it was designed by John Calvin Stevens in the late 19th or early 20th centuries. 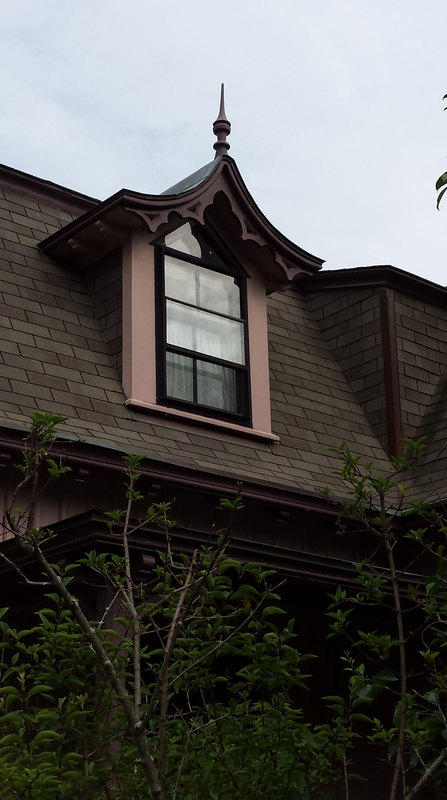 The second story dormers on the front facade are especially well detailed and scaled. As is the entry gable seen below. The 1924 tax rolls list Caroline Woodman as the owner. Combined valuation was $7574.00. The current owners are a local cardiac surgeon and a real estate agent. Combined valuation is $768,200.00. 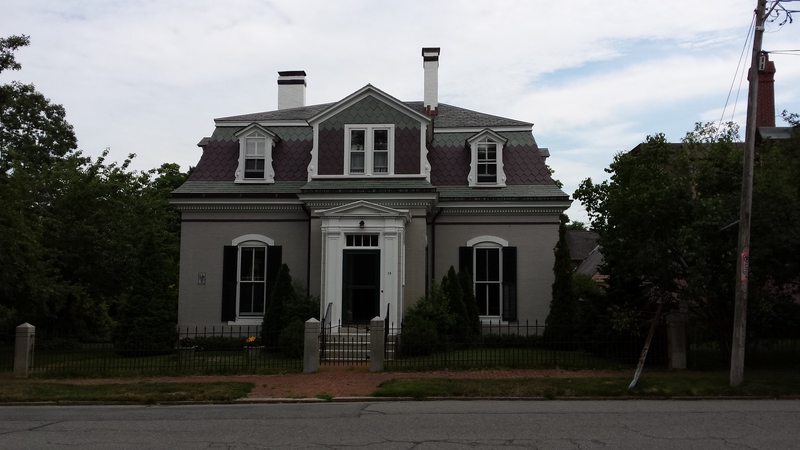 This entry was posted in Architecture, Bowdoin Street, History, Images, Vaughan Street, West End Walks and tagged Architecture, History, images, Maine, mansard roof, Portland, The Gothic Revival on July 12, 2015 by alewifecove.